Nothing beats the classics when it comes to pavlova. I have updated my basic recipe with some tangy passionfruit curd. Fresh berries, cream, and curd are all this pavlova needs to be a perfectly balanced dessert. The recipe I developed and baked on the Great Australian Bake Off was the result of me overthinking and getting a bit too experimental. Hideous panicked over decorating aside, the Bake Off one is a pretty good mix, but there’s just a bit much going on. Nothing beats the basics, the passion fruit and berry recipe here is truly my family’s favourite. Amusingly, if you do check out my disastrous overdesigned Bake-Off recipe, I recommend ignoring the bit about the pavlova, or trying to assemble the components into a pavlova… However, the recipe does contain a few really nifty recipes for different pastry creams, stabilised cream, cherry reduction, roasted cherries, fruit glaze.. all of which work great… for other applications… not so much for pavlova…. 250ml passionfruit pulp and juice- Strain out the seeds. Fresh is great if you have a vine, but canned pulp works absolutely fine! You can use regular whipping cream and stabilise it with gelatine, but thickened cream in Australia already has stabilising ingredients so it will hold its shape once it’s whipped, and it’s a lot less faffing about. Fresh pitted cherries, sliced peaches, mangoes or kiwi fruit also make nice additions/alternatives, but the key fruits mentioned above are more than sufficient. Strain the passion fruit seeds from the juice through a coarse sieve. Mix the cornflour with 2 or 3 tbsp of the juice to form a lump free, thin cornflour paste. Dump all the ingredients for the curd into a saucepan, and whisk to combine. Bring the mixture to a gentle simmer while whisking continually to prevent lumps or sticking. Continue to heat and whisk until the mixture thickens to the consistency of pourable custard. Avoid overheating, the mix should never go above a very gentle simmer, you’re making Curd, not jam. Strain it through a sieve to remove any lumps and chill. The curd will thicken up a little more as it cools. Leftover curd is great in other deserts, it works great as a filling for choux buns along with pastry cream. I like it spread very thick on white bread. This recipe makes a fairly loose curd, once cold it will be spreadable, but still very slightly runny. Separate eggs, retain the egg yolks for use in the curd later on. Wipe over the bowl and whisk attachment of a stand mixer with vinegar. Place egg whites, salt and sugar in the bowl together and start mixing on low for a minute before increasing the speed to high. Mix on high for at least 15 minutes, or until the mixture feels nearly smooth when pinched and rubbed between your fingertips. Mixing the sugar and egg white all together at the start helps the sugar dissolve quicker and more smoothly. The vinegar and salt help to stabilise the egg whites. After 15 minutes the mix should be at the stiff peaks stage. Add the vinegar and vanilla, mix for another couple of minutes to incorporate, add the lemon juice and mix a further couple of minutes. While the egg whites are whipping preheat the oven to 120C. Line three large biscuit tray with baking paper. Draw a 20cm circle on the underside of the paper to act a a guide. Spoon an even amount of the pavlova meringue into the centre of each circle. Gently level off the top and push the meringue to the edge of the circle. Bake for 1 hour in total, be sure to turn the trays and change the shelves the trays are on after half an hour of baking to ensure even cooking. After an hour turn off the oven and leave to cool in the oven with the door very slightly ajar, wedge open slightly with a heatproof oven mitt or tea towel. It is important the pavlovas don’t cool down too quickly or the heat shock will cause the marshmallow-like meringue in the middle to contract quickly leaving big hollows and the crunchy outside will crack. Some cracks are inevitable and are not a bad thing, but the outside should not completely shatter away from the inside. Once the pavlovas are completely cool they can be stored at room temperature in a loosely covered container until ready to use, they will last a day or two stored in a cool dry place, kept away from humidity. Place the thickest or most untidy layer on a cake board or serving plate. Spread the top with passion fruit curd, evenly sprinkle on sliced strawberries, some torn raspberries, blueberries and fresh red currants, then add a layer of whipped cream. 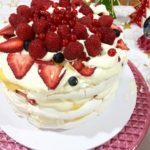 Top with the second pavlova layer, then repeat the curd fruit and cream and top with the final layer of pavlova (usually the most attractive and even layer). Spread with passion fruit curd, top with cream. Arrange raspberries and sliced strawberries in alternating rings, and scatter the top with red currants and blueberries. Dot on fresh passion fruit pulp or leftover curd.